Plan, schedule, and launch promotions that will engage audiences, increase customer loyalty, and ultimately drive revenue to your online store. Launch unique promotions (e.g. free shipping, 50% off, buy 2 get 1 free) for multiple audiences based on their geographic location, currency, and/or specific user-group. The Kooomo platform enables you to schedule promotions to launch at specific times, maximising sales opportunities across your target markets. The average shopping cart abandonment rate is 67.9%. 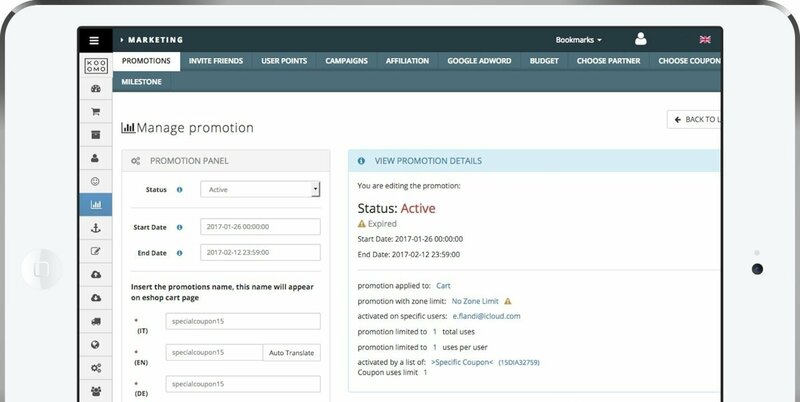 Tools within our promotion management tool enable you to build exit-intent pop-ups that not only remind users that they are leaving the site with items in their cart, but also triggers specific discount codes (e.g. free shipping, extra 10% off) to encourage shoppers to complete their transaction. Advanced platform features from Kooomo enable you to integrate your offline customer loyalty programme into your online store. Enable customers to log into their own personalised accounts, check their points, and redeem them against products. You can also further reward loyalty card holders by displaying preferred pricing on specific items, boosting your customer experience and driving conversions.